NASA releases new high-resolution views of three Apollo moon landing sites, sent back by Lunar Reconnaissance Orbiter. NBC's Brian Williams reports. NASA today released the sharpest views of three Apollo moon landing sites ever sent back by its Lunar Reconnaissance Orbiter. "We all like to obsess and look at the Apollo landing site images because it's fun," said Arizona State University's Mark Robinson, principal investigator for the Lunar Reconnaissance Orbiter Camera, or LROC. "People actually used to be able to go to the moon. People used to explore the moon. Hopefully, sometime in the near future, that will continue again. But LROC is looking at the whole moon." LRO's high-resolution camera has been looking at the whole moon, including all six of the Apollo landing sites, for the past two years. But these particular images are special because they were taken from the closest vantage point the orbiter will ever have during its $504 million mission. Because of adjustments in the car-sized probe's orbit, lately it's been flying as low as 14 miles (22 kilometers) above the lunar surface. 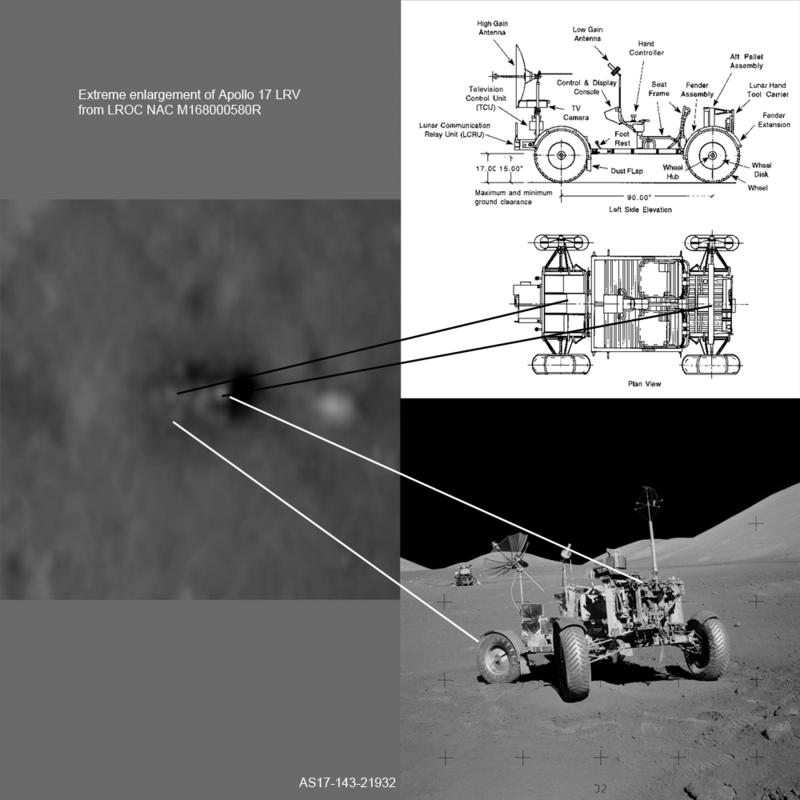 That means the resolution for these three landing sites — Apollo 12 in 1969, Apollo 14 in 1971 and Apollo 17 in 1972 — is twice as sharp as that seen in the previous images. Each pixel covers just 10 inches (25 centimeters), as opposed to 20 inches per pixel previously. "When I first took a look at these images, my jaw flopped to the ground," Noah Petro, a member of the LRO research team from NASA's Goddard Space Flight Center said in a video featuring the new imagery. This image from NASA's Lunar Reconnaissance Orbiter shows the tracks and the trash left behind by the Apollo 17 mission in 1972. 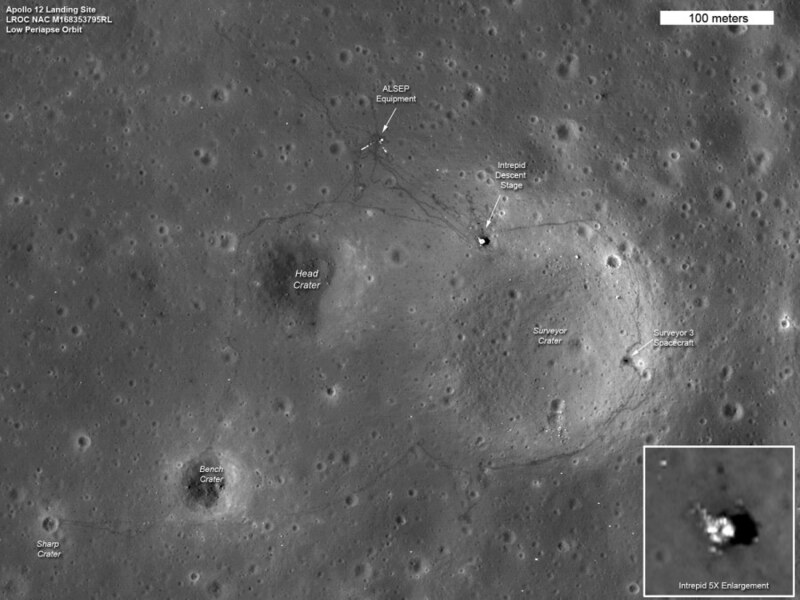 The picture of the Apollo 17 site in the moon's Taurus-Littrow valley is sharp enough to show the tracks of the astronauts and their lunar rover in unprecedented detail. You can make out the lunar module's descent stage (dubbed "Challenger"), as well as the module's experimental pallet, the ladder leading down to the lunar surface (it's a bright prominence at the 9 o'clock point on the inset enlargement of Challenger) and the life-support backpacks that Gene Cernan and Harrison "Jack" Schmitt threw out of the ascent module just before they took off (labeled as PLSS ... portable life support system ... in the picture above). Robinson said the new imagery initially raised questions about the debris that was scattered around the descent stage. "There seemed to be too much 'stuff' on the ground," he told reporters. Later, the scientists figured out that the excess "stuff" was actually packing material for the instruments, as well as insulation that was blown off the descent stage during the Apollo 17 astronauts' takeoff. Off to the right of the frame, Apollo 17's lunar rover (labeled as LRV) shows up in such detail that "if you squint really hard, you can begin to resolve the seats and the fact that the wheels were left turned slightly to the left," Robinson said. Robinson said he had to check with Schmitt to confirm some of the features he thought he saw in the latest imagery. Schmitt was suitably impressed. "Jack's comment was, 'We need to image the whole valley at this resolution.' I agree with him," Robinson reported. Check out this video for a guided tour of the Apollo 17 site based on the new views. The pictures show traces of the experiments left behind by the moon missions — giving the lie to claims that humans never traveled to the moon. The experimental retroreflectors left behind several Apollo missions are still used to calibrate laser-ranging devices on Earth and even LRO's instruments in lunar orbit. This picture from NASA's Lunar Reconnaissance Orbiter shows tracks left behind by Apollo 14 astronauts Alan Shepard and Edgar Mitchell as they roved around the lunar surface. Unfortunately, not even the latest imagery is sharp enough to show the golf balls that Apollo 14 astronaut Alan Shepard said he sent flying for "miles and miles and miles" on the moon in 1971. "Those are too small to be resolved," Robinson said. This LRO image shows the areas visited by Apollo 12 astronauts in 1969. What about the other Apollo landing sites? "It wasn't possible to image easily all six sites," said Richard Vondrak, LRO project scientist at NASA's Goddard Space Flight Center. For example, the lighting conditions during the times when the probe flew over the Apollo 11 landing site weren't optimal for producing higher-resolution pictures, he said. Robinson said the Apollo pictures made up just a small fraction of the 1,500 narrow-angle images taken during the orbiter's super-close-up series of orbits. Now the spacecraft is now in the process of moving into a wider orbit for the mission's next phase of scientific observations. "These are the sharpest images that we plan for this mission," Vondrak said. Vondrak said the amount of data returned by the LRO mission so far amounts to 245 terabytes, which is equivalent to the amount of data contained in a stack of 52,000 DVDs. "If you took this stack and put it on the ground floor of the Capitol Building in Washington, it would reach to the top of the Capitol Dome," he said. LRO could keep going for several more years, and we'll continue to see lower-resolution pictures of the Apollo landing sites as the mission proceeds. Beyond the fun factor, the LRO team uses the Apollo pictures to study how the sites look under different lighting conditions, as well as reference points for determining precise locations in other lunar imagery, Robinson said. The pictures also will come in handy for planning future missions to the moon, said Jim Green, director of the Planetary Science Division at NASA Headquarters in Washington. The next lunar mission, known as Grail, is due for launch this week. LRO "really provides a rich opportunity to map the moon and allow us to contemplate additional sites where samples of a special nature could be determined, and then future missions could potentially be planned," Green said. "Relative to exploration," Green continued, "indeed, LRO has been used extensively to be able to provide the exploration people [with] the kind of altimeter and high-resolution maps for them to be able to plan potential future sites that humans may want to go to on the moon, as plans emerge." When do you think humans will follow robotic spacecraft to the moon? Or will the robots do such a good job that we won't need to send humans? Feel free to weigh in with your comments below. Short video showing the new images and identifying important features of the Apollo missions. Update for 5:10 p.m. 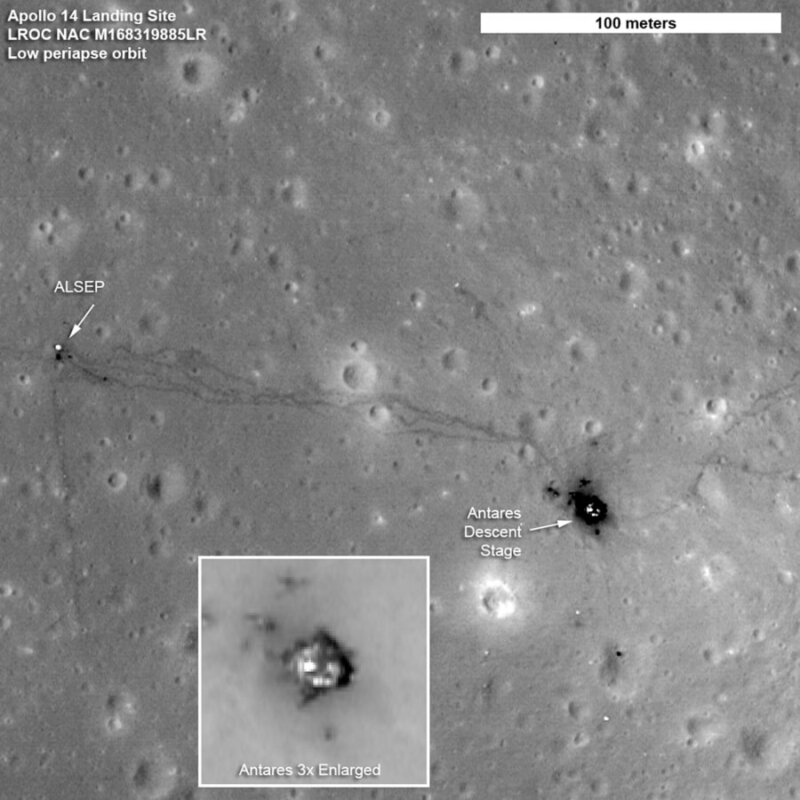 ET: Will the tracks and the trash from the Apollo missions be visible forever? "Forever is a long time," Robinson said, "so the answer is no, they won't be there forever." Robinson noted that the moon is constantly being bombarded by cosmic debris, ranging from bits of grit to giant asteroids. "Slowly, over time, first, the tracks will disappear," he said. "They'll be all ground into, mixed into the soil. Then the smaller pieces of equipment will disappear. Eventually, the descent stages will get probably blasted with a larger asteroid. From Apollo rocks and other analyses that were done, we know that a rock erodes at something like the rate of 1 millimeter per million years. It's very slow. So in human terms it may seem like forever. But in geologic terms probably there will be no traces of Apollo exploration, oh, let's say in 10 [million] to 100 million years."